"Mr. and Mrs." Digital Stamp gives Mrs. Claus her just do. She is always quietly working in the background, and we just thought that she should have some accolades as well! How will you make her look in your project? A great creative addition for your card making, scrapbooking, and hybrid scrapbooking projects. Stamp is created as an 8in x 6in approx. image so that you can resize it to fit your creation. 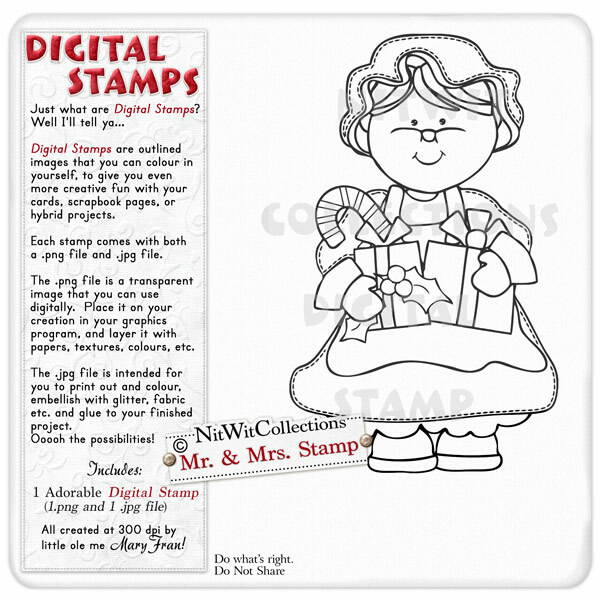 1 Mrs. Claus Stamp (2 files - 1 image is a .png file and 1 is a .jpg file format).